The latest iOS 11.2 now displays a notification message in Control Center when you toggle on or off Wireless. Disabling Wireless or Bluetooth in Control Center only disables these options until a condition is met mentioned below. The current Wi-Fi network and others nearby will be disconnected until tomorrow. 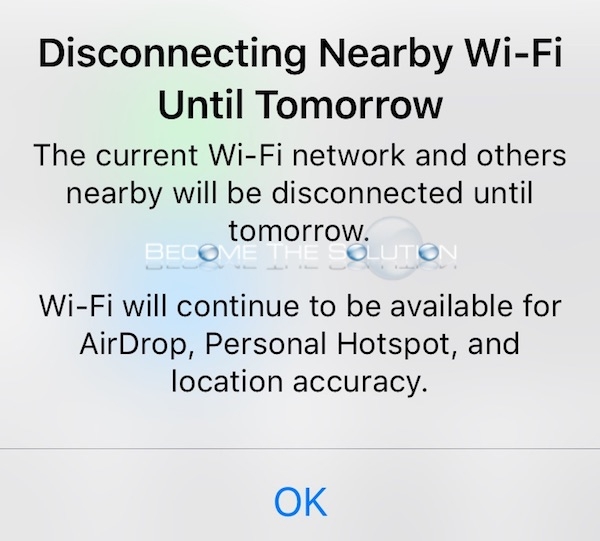 Wi-Fi will continue to be available for AirDrop, Personal Hotspot, and location accuracy. Currently connected accessories will be disconnected and other accessories will not connect. Bluetooth will continue to be available for Apple Watch, Apple Pencil, Personal Hotspot, and Handoff. 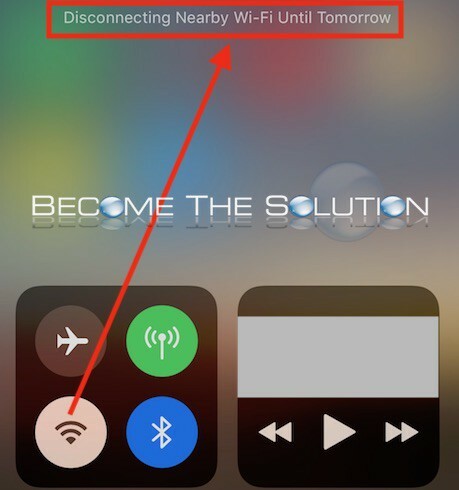 In order to permanently disable Wi-Fi or Bluetooth, you must do so now in iOS settings. The new Control Center notification messages may seem confusing at first, but in reality you can still use Control Center to disable Wi-Fi or Bluetooth quickly if you still need to. If you need to disable Wi-Fi or Bluetooth permanently, do so in iOS settings. lol...thank you people-I am not alone in thinking this is absolutely STUPID! Yet another unwanted worm infesting Apple software! Get rid of it!!! I could not agree more with some of the others here. When I want wifi off, I want it off until I choose to turn it back on. Is it so difficult to include another button in Control Center to switch it off completely? This oversight is inexplicable. Is there any way to make the disconnecting wifi nearby after tommarow butten work out?? This is totally RIDICILIOUS!!! !, especially when travel a lot and need my bluetooth to connect to my car so I can take calls when I am on the road, with out my bluetooth I am not able to be hand free and this causes a HUGE inconvenience. Apple really needs to rethink this!!!!! I ready to get rid of my i-phone!!!! !